I love snacks; I do enjoy snacking, thumb up if you do. So munchers, we got to make sure our snacks are healthy, without packing on high amount of extra calories, which may leave you feeling bloated and regretful. Be sure to watch this video through and add it to your favourite playlist because I’m going to share with you 4 3-ingredient VEGAN Snack Bite, which you can whip up in under 5 minutes. No baking and no cooking are required. Really easy. Believe me, you would want to eat the entire batch after taking your first bite. So be warned! These healthy snack bites are perfect to satisfy your sudden munchy cravings, great as a pre and post workout snack, as an energy booster and you can bring them to work or school. Do you have 5 minutes to spare? If yes, let’s make these wholesome healthy bites. 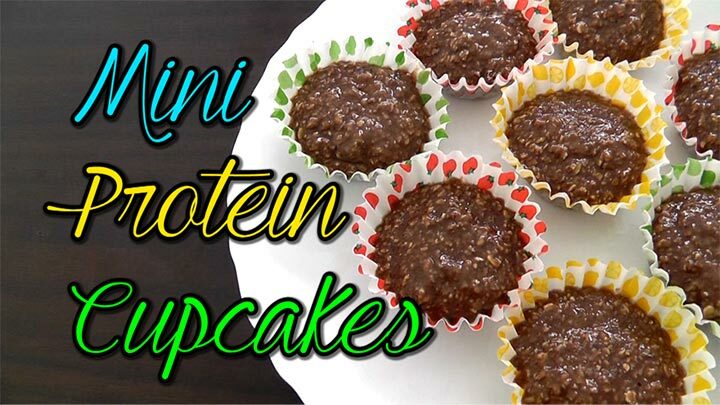 If you need a quick and easy to consume pre or post workout snack with protein and carbs, then you got to make these mini protein cupcakes. 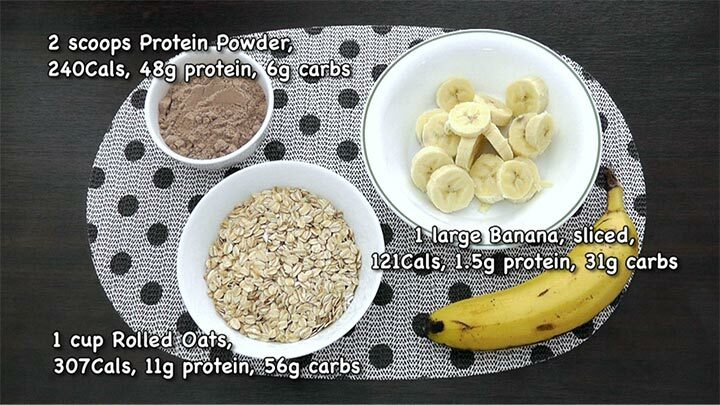 Add rolled oats and protein powder into a food processor. Process very quickly just until the oats are slightly chopped but not completely smooth. Then add the banana and continue to process until well combined. Transfer the mixture evenly into 12 mini cupcake liners. Store in an airtight container and freeze them up. Allow it to defrost for about 5 minutes before consuming. If you want to bring them out with you, then choose to bake the them in the oven for 10 – 15 minutes. 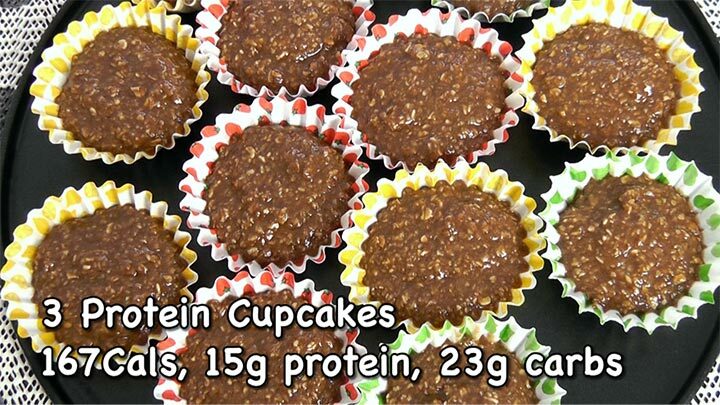 Each protein cupcake has 56 Calories. A serving of 3 mini cupcakes contain 167 calories, 15g of protein and 23g carbs; a great pre or post workout snack. You can jazz up this basic recipe by mixing in some dried fruits, chopped nuts or seeds. 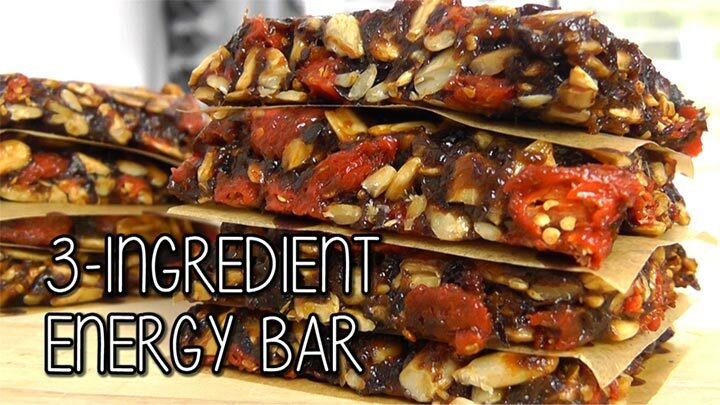 I’m sure most of you have come across the 3-Ingredient Energy Bar. I’m going to also share this wit you because it’s so versatile and you can keep making it with different ingredients. *Because they are sticky, they are the main ingredient to hold the mixture together. *This will give you the chewy texture and natural sweetness. I used goji berries. *This is to add crunchiness into the bar. I opted for Sunflower Seeds. In a food processor, add in the prunes and process until they begin to form a paste. 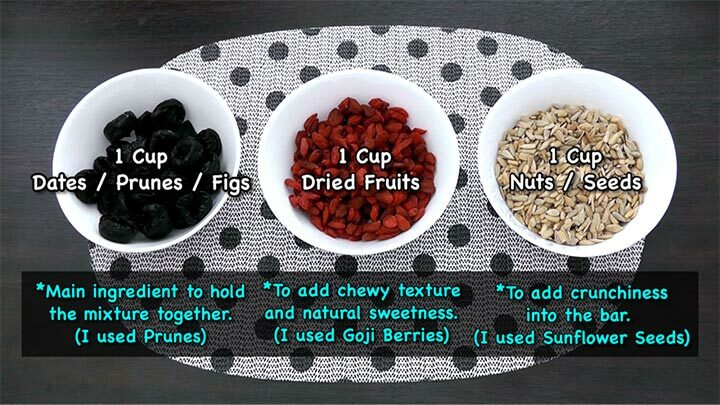 Then mix in the goji berries and sunflower seeds. Continue to process very quickly just to combine the ingredients. The mixture may loosen up with the addition of fruits and nuts and the texture will chunky, but that’s okay. Transfer the mixture onto a parchment lined pan and press down firmly to form a thick square. Wrap and chill in the fridge for about 1 – 2 hours until firm. Once firm, cut into 12 bars. 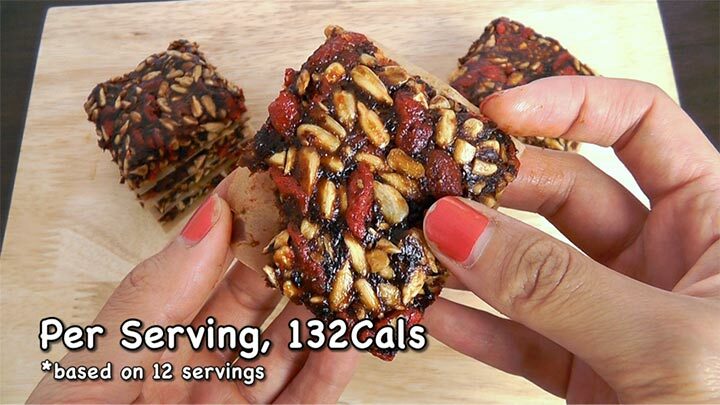 Store these energy bars in the fridge until ready for consumption. It will last up to 2 weeks. Prunes contain less sugar than dates, so they are a good option if you are looking to keep the sugar content low. I like to carry this energy bar in my bag, in case if I need a quick energy booster to keep me going, I have a healthy option to turn to. Bare in mind that, they are sticky but so yummy. Try this recipe and keep experimenting with different combinations. 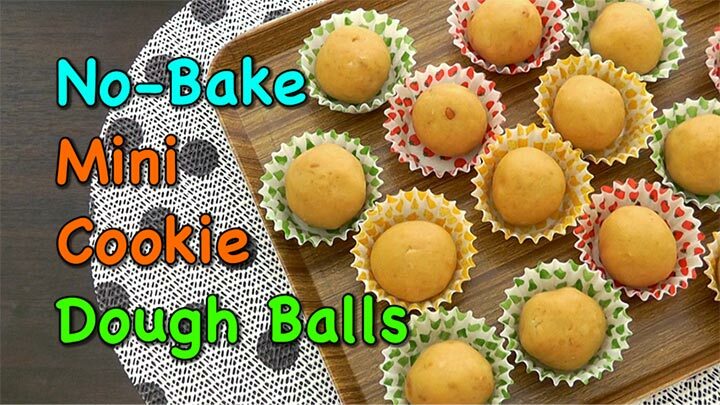 If you fancy those half baked or soft cookies, well these mini cookie dough balls are a great healthy option. They are soft, naturally sweetened and made only with ‘real’ food. 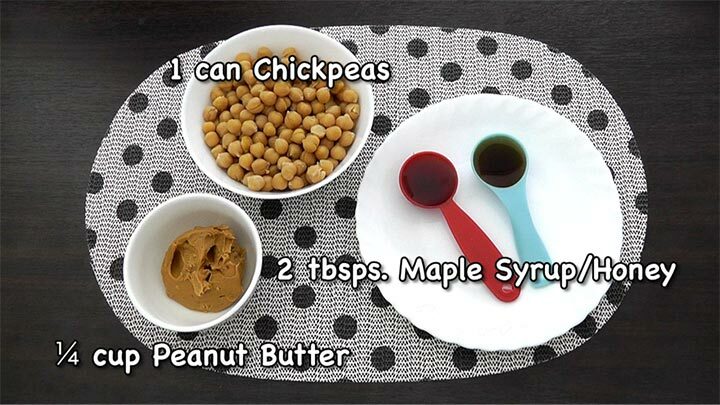 In a food processor, mix in chickpeas, peanut butter and maple syrup. Process on high speed until smooth and well combined. If you don’t have a powerful blender like me, then you may need to scrap off the side and keep blending. You should have a rather smooth dough, but don’t worry if it’s a little bit chunky. Next, roll and form 16 mini cookie dough balls. Place them on baking sheet or cupcake liners. You may choose to freeze them until solid or chill in the fridge for a softer texture. Or, just eat immediately! They are so good. Chickpeas are used as the foundation to this healthy cookie dough but don’t worry you can barely taste the chickpeas. Peanut butter adds a slight nutty flavor, which can also be replaced with any nut or seed butter of your choice. 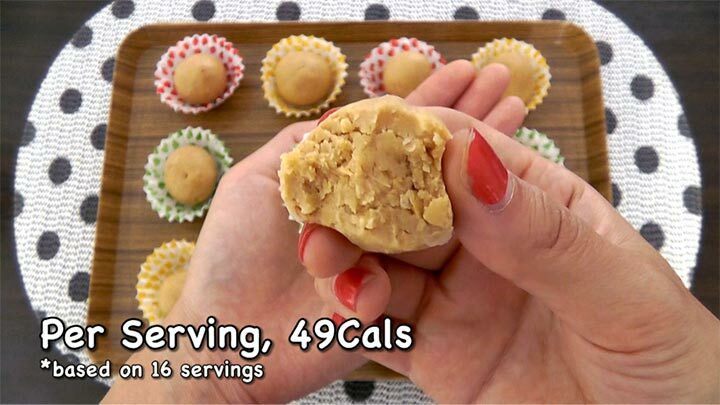 Each cookie dough bite is only 49Cals. If you want to, you can even bake them for a crunchier texture. All these recipes are super easy and versatile. With the basic 3 ingredients, you can jazz it up with all kind of ‘add-ins’ to suit your taste, such as chocolate chips, chia seeds, shredded coconut, any nuts or seeds and more.